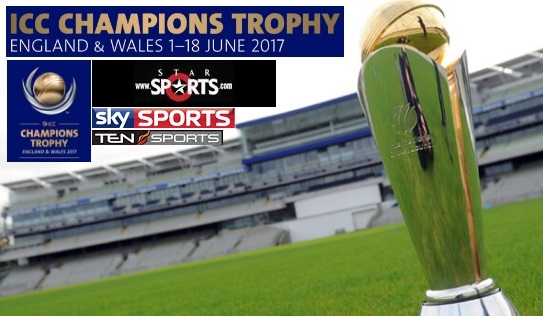 ICC Champions Trophy 2017 will take place this June 2017 in England and it is the second biggest 50 over tournament after cricket world cup. Only top 8 teams contest and ICC has already released the groups and fixtures ahead of the big competition. Champions Trophy has played as second fiddle to 50 over World Cup for most part but when it comes to sheer competitiveness nature, Champions Trophy is more unpredictable and harder to win. As we move closer to the start of competition in June, traditional cricket broadcasters have started confirm their TV schedule for Champions Trophy around the cricketing world. We take a look at channels which will be broadcasting the tournament live in different parts of the world. Pakistan TenSports (to broadcast all champions trophy matches) PTV (might have live coverage of only pakistan matches.